My predisposition to free stuff seems to rear its ugly head most often in reference to KIND products. Of all the KIND reviews I've posted on this blog, I think I've only actually paid for maybe two of them at most. I've gotten the rest of them through KINDING Missions (this one) or via a free add-on to an order that I made on Amazon.com. 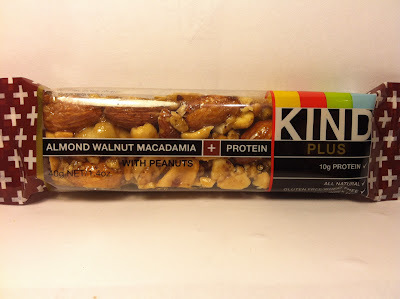 So, armed with another freebie, I was ready to dive into another KIND review with this KIND Plus Walnut Macadamia + Protein with Peanuts Bar. This bar comes in at 1.4 ounces and has 190 calories and ten grams of protein. It's all natural, gluten free, wheat free, etc. With the clear packaging, there are never any surprises when taking the bar out, but even through the clear packaging, I could say that I was overwhelmingly surprised by not only the amount of nuts in this bar, but also the size of the nuts in this bar. Those nuts included walnuts, macadamia nuts, almonds, peanuts and brazil nuts. Basically, this was a mixed nut mix that you can find at any grocery store with the exception that it was in bar form and since it was in bar form, it needed some sort of binder and that could be found in the typical syrups found in these bars in addition to honey (and the requisite soy crisps). Because of the presence of that honey, the bar was exceptionally sticky. The honey carried a faint smell and the peanuts in the jumble also carried a slight smell as well. Biting into this was just like sticking my hand into a jar of mixed nuts and pouring them into my mouth as there was crunch in every direction to be found and being that I am an avowed crunchy junkie, I could not have been more pleased by that. The nut flavors themselves had standouts from the peanuts, which were by far the strongest flavor, and then the walnuts which carried a faint flavoring after that. Outside of those two, everything else kind of blended together. The honey added a nice, faint taste of sweetness to the bar to counteract the saltiness of the nuts and that was nice, but really, not really necessary in my opinion. 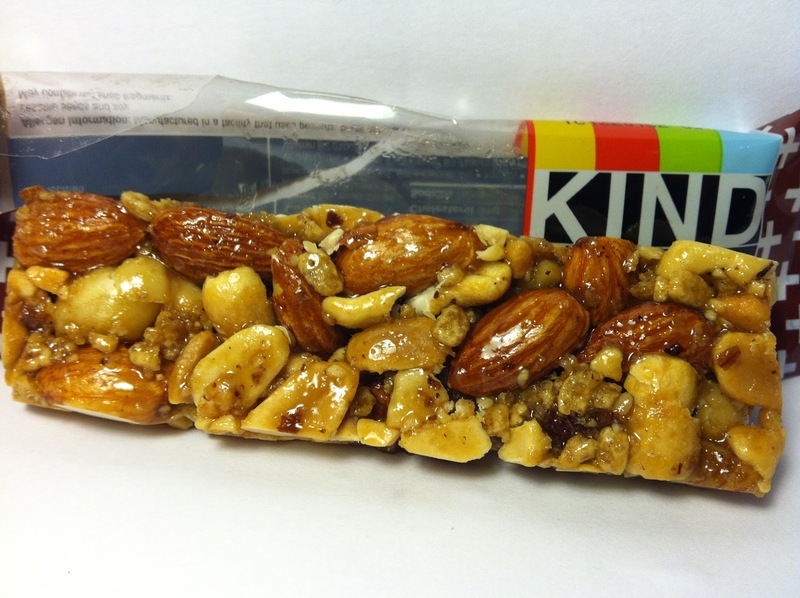 The nuts themselves were enough to make this bar and they did an excellent job of that. Buy It or Fly By It? Frankly, I loved this bar, so it gets a BUY IT rating. If beggars were to be choosers, my only constructive criticism is that this could have used some raisins and/or a hint of chocolate to make this similar to a real trail mix. Of course, this bar was more of a mixed nut mix, so me complaining about the lack of raisins and/or chocolate just proves that I'm off my rocker (something I already knew). Regardless, if you ever see this one and are a mixed nut lover, grab it and you'll enjoy every bite. I hope you get the chance to try their apricot yogurt covered one. Its my favorite.